Areas of undisturbed wetlands and patches of old-growth forests make this park particularly significant in the region. There are no roads, no camping or day-use facilities, and only a few trails, within the park. Special Features: Extensive wetland meadows complexes in Engelmann spruce- Sub- alpine Fir dry, cold subzone. Motorized vehicles are prohibited in this area except snowmobiles in winter. If required, there is an old forestry lookout that serves as a shelter for emergency use. There are no other cabins, yurts or lodges for public use. The Kamloops Snowmobile Association has a trailer and a chalet located outside the park boundaries and is only for their private use. Camp stoves are recommended for cooking. No firewood is available and no fire rings are installed. If a campfire is required, please keep it small and ensure it is completely out before you leave. Only wood that is dead and lying on the ground can be used for campfires. Check for campfire bans before entering the backcountry. In some parks, campfires are not permitted at any time. At the southern end of Bonaparte Plateau, approximately 40 km northwest of Kamloops. The park is best accessed from the southeast via Watching Creek Forest Service Road. Cultural Heritage: An old Ministry of Forest lookout tower is located on the ridge. Historic pack-trail from Pass Lake to Porcupine Ridge was used by early surveyors. There is an 1828 Dominion Lands & Surveys marker on a rock beside the fire tower. Remnants of old Fruitlands Irrigation District trails are found around Carlo Lake. Conservation:	Porcupine Meadows Park protects extensive subalpine wetlands and old-growth forests. 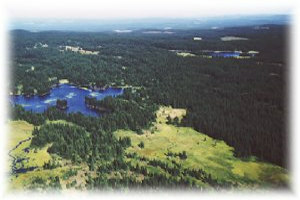 These ecosystem features contribute special landscape representation significance within a system of six parks including Porcupine Meadows in the south and extending north through Tsintsunko, Bonaparte, High Lakes Basin, Emar Lakes and Taweel parks which, in combination, capture the biological diversity of the Northern Thompson Uplands Ecosection. The park is largely undisturbed and there is no cattle grazing. Wildlife: This park contains wetlands important to many wildlife species, including sandhill cranes. These wetlands are also attractive summer habitat for moose and mule deer. Limited, primitive trails without signs. Maps, compass and knowledge of the area are essential. For your own safety and the preservation of the park, obey posted signs and keep to designated trails. Shortcutting trails destroys plant life and soil structure. There are wildlife viewing opportunities in this park. Moose and sandhill cranes are found in the park. Snowshoeing is permitted in this park; however, there are no maintained trails. For snowmobilers, the Kamloops Snowmobile Association maintains trails into the area and an old forestry lookout tower serves as a shelter for emergency use.